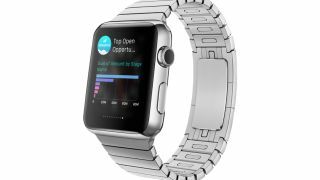 Salesforce has 20 new Apple Watch apps ready to go and all are designed to be used by enterprises with the aim of improving customer service. At an event on Tuesday the company announced the 20 new apps have been built by partner companies that are part of its Salesforce Wear development program and it gave intimate details on five of the apps, according to Venture Beat. NVM Connect identifies incoming calls and provides data about the number by using Salesforce CRM before bringing the salesperson facts and information to use during the call. BetterWorks Wear, meanwhile, allows employers to give sales assistants information via the Apple Watch pertaining to goals and strategies on both an individual and team basis. ContactWorld is another that uses Salesforce CRM data to give sales people the chance to comb over data concerning customers and then provide a level of service that is most appropriate to the situation. Vlocity World works in a similar way and uses the Salesforce Sales Cloud and Service Cloud to gain customer profile data to complete tasks in such a way that customers enjoy a much more rounded experience. Finally, TaskRay by Bracket Labs is designed to make it simple to see any project's status using specially designed gauges and it even allows updates to be added using dictation. The remaining 15 apps will be unveiled at a later stage by the following partners: Alpine Metrics, Apttus, BrainHearts, Fairsail, FinancialForce.com, Footprints, HeyWire, InsideSales, Point of Reference, Proximity Insight, Remedyforce, Sage, ServiceMax, Skedulo and TeamSpirit.